There’s no question that the 2016 presidential election left an indelible mark on the United States, unearthed deep-seated attitudes, amplified critical national conversations and influenced America’s reputation on the global stage. 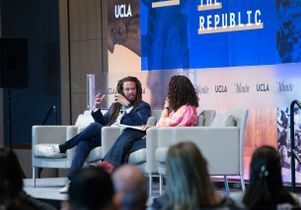 The subjects of who Americans are, what America represents and how the country might begin to bridge the current political chasm and alleviate internal dysfunction were on the minds of audience members and speakers alike at The Atlantic’s “Recoding the Republic” conference, held Thursday at the UCLA Meyer and Renee Luskin Conference Center. Exploration of the American ideal was a founding mission of the magazine, said Low, adding that there was a belief that there was something exceptional about America, democracy, rights, equality, liberty for all and a government that represented the people. The event drew an eclectic audience for lively and interactive conversations between Atlantic editors and writers and invited guests that included Rep. Ted Lieu, a Democrat who represents California’s 33rd congressional district, which includes UCLA and Westwood; Franklin Leonard, founder of The Black List, a website that identifies screenplays with promising production potential; Pedro Noguera, distinguished professor of education at the UCLA Graduate School of Education and Information Studies and director of the Center for the Transformation of Schools; Andy Richter, actor, writer and “Conan” sidekick; and Caitlin Flanagan, a contributing editor at the Atlantic. 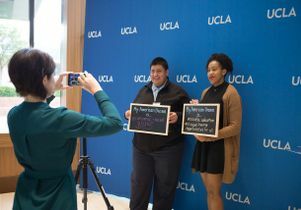 “This is clearly a divisive moment in America,” said UCLA Chancellor Gene Block in his welcome remarks. 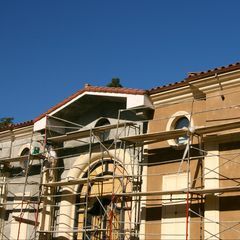 “That culture of division is sometimes reflected on campus, where we too struggle with complicated issues such as free speech issues.” Block added that healthy dialogue and debate arecritical, as is listening to the opinions of others, regardless of whether one agrees with what is being said. “We strive for respectful dialogue and open discussion, but preserving both really poses constant challenges for us, and this is always top of my mind when we have invited speakers that we can have a venue where people can speak about really impactful, but also controversial issues and be allowed to speak freely and receive a respectful reception,” Block said. Segmented into seven distinct discussions, the conversations explored the history of the United States, the current social and political climate, American exceptionalism, and the roles that entertainment, media, technology, digital privacy, education, immigration, identity and free speech play in our national fracture and its repair. 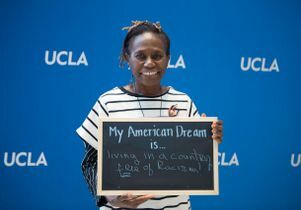 The topic of the American Dream was also touched on, in the panels and before the May 31 event in conversations on campus at UCLA. The event opened with a discussion between Jeffery Goldberg, editor in chief at The Atlantic, and Amy Chua, a professor at the Yale School of Law and author of the book “Political Tribes,” about the state of the American Dream and the impact that nationalism, shifting demographics, identity and patriotism have played in the current state of the country. 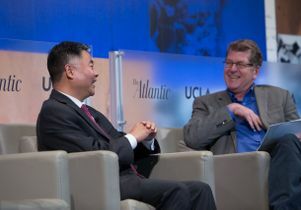 Congressman Lieu, who sits on the House Judiciary Committee and the House Foreign Affairs Committee and is an assistant whip for the Democratic caucus, spoke with Steve Clemons, The Atlantic’s Washington editor at large and gave a behind the curtain look at politics in Washington. Lieu also shared his views on the Trump Administration and the political landscape. But, said Lieu, that doesn’t mean that Trump doesn’t get some things right, adding that said he supports Trump’s decision to pass “right to try” legislation, which allows gravely ill patients the ability to try experimental drugs, and his decision to withdraw from negotiating the Trans Pacific-Partnership. He does not support Trump’s recent decision to impose trade tariffs, a position that Trump announced just hours before the UCLA conference. Frankin Leonard from The Black List and Alison Stewart, a contributing editor at The Atlantic, spoke about the role that film and television have historically had in crafting people’s social attitudes and perceptions of people of color, the need for inclusivity when it comes to the people who are creating content and making decisions about the types of projects that get made, and how to increase diversity in storytelling. A conversation between Cindy Cohn, executive director of the Electronic Frontier Foundation; Alex Feerst, head of legal for Medium; and The Atlantic’s Steve Clemons, asked if technology is killing speech and democracy. This was followed by a discussion about American exceptionalism among David Frum, senior editor at The Atlantic and author of “Trumpocracy: The corruption of the American Republic”; Andy Richter; and The Atlantic’s Alison Stewart. 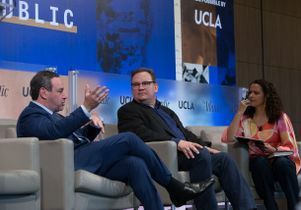 Jamie Casap, Google’s chief education evangelist; Linda Lopez, who heads the Office of Immigrant Affairs in the Los Angeles Mayor’s Office; and UCLA’s Pedro Noguera took on the subject of immigration, education, social mobility and the American Dream. The event closed with a conversation about the future of free speech, featuring Caitlin Flanagan and Jeffery Goldberg, both from The Atlantic. 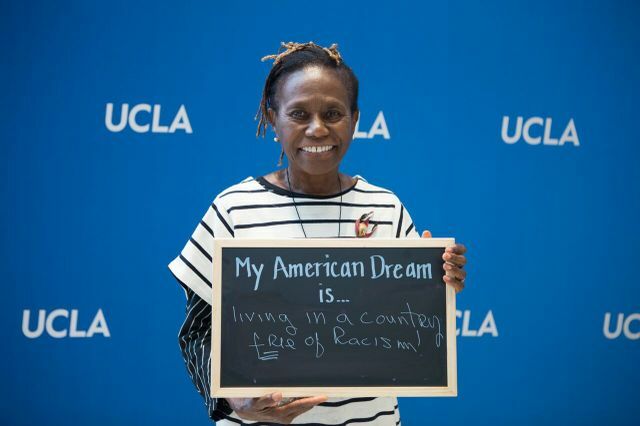 One of many guests who attended The Atlantic's "Recoding the Rupublic" at UCLA and shared their American Dream. 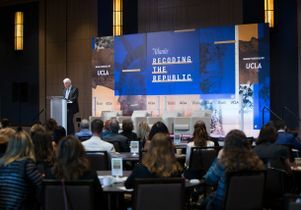 Chancellor Gene Block at "Recoding the Republic"